Some friends had to remove a large pin oak from their back yard, as it was declining and would soon pose a hazard to their house. They were sectioning most of the large branches and upper trunk for firewood, but were interested when I mentioned the possibility of milling some of the trunk for use in something that would last longer. So began our adventure of brainstorming and design work, which appears to be leading us toward a coffee table and a console made from the quarter-sawn lumber. 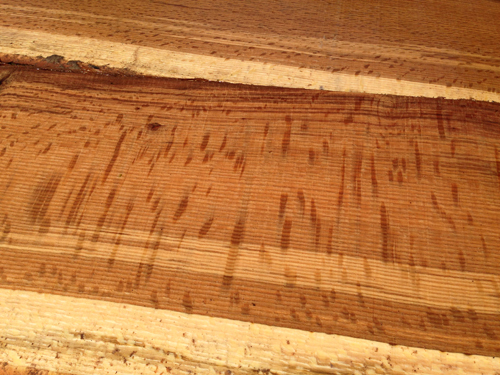 Here are a few photos showing the transition from the original trunk to fresh sawn lumber. The wood is currently air drying, but will be finished in a kiln this fall. 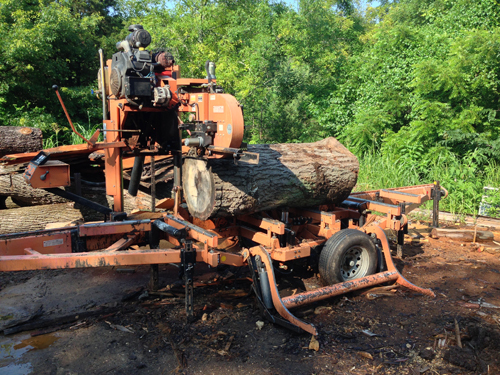 Here's the log set up on the portable mill, ready for the first cut. 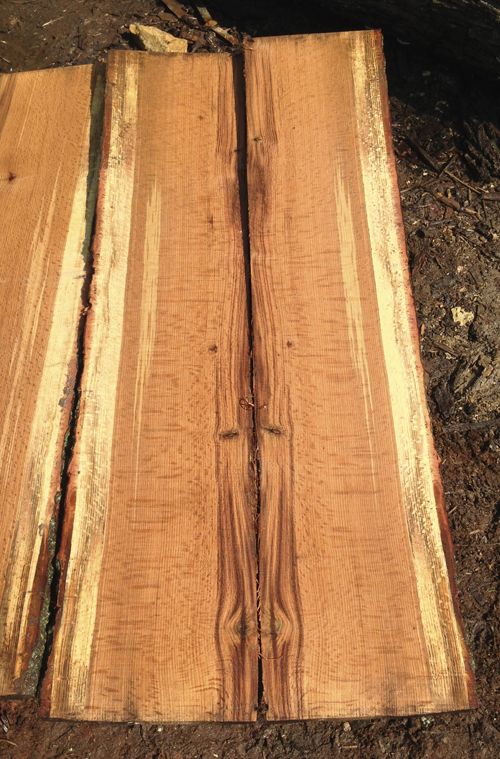 When quarter-sawn, the oak reveals its striking medullar rays. 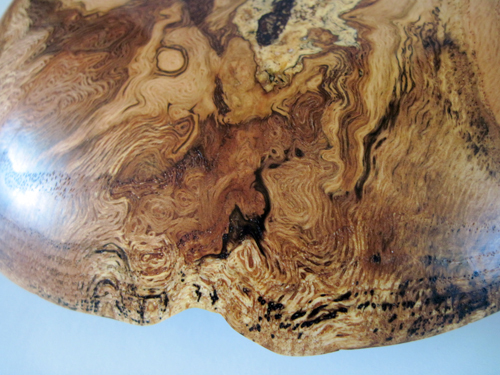 There is a strong contrast between heart and sap wood, and some interesting irregularities within this wood. 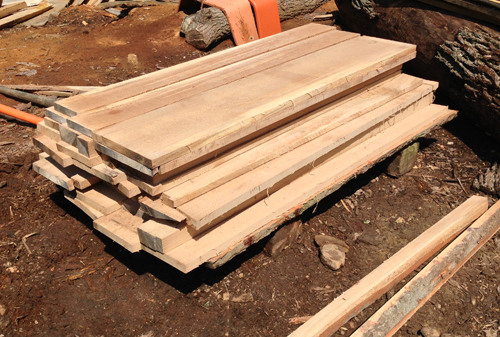 We ended up with a generous stack of select cuts, most of which is 4/4 (one inch thick) stock. I kept a few pieces at 8/4 in order to have options for legs and structural members. I'll be book matching consecutive cuts for the tops, perhaps maintaining a natural edge or two. I’m not typically a big fan of red oak, but this one was cut effectively to reveal good flecking and a few pleasant surprises in color variation. Last year I found a red oak crotch piece where two trunks had grown almost parallel to each other for several feet, and the grain went wild along the merging edges. 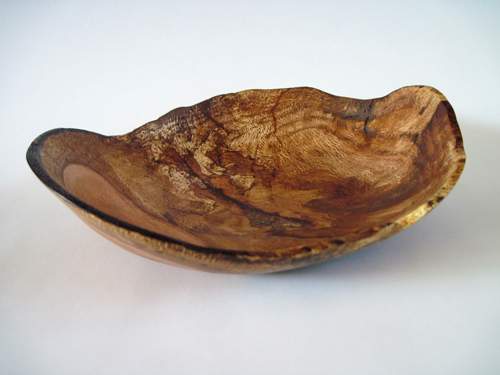 I turned two shallow bowls out of it, one of which is pictured below. Opening a piece of wood is like unwrapping a present. Further cutting, surfacing, and construction reveal qualities that shape meaning through function and aesthetic experience. When this is coupled with a memory of the raw materials, a personal history that preceded the wood’s cultural usefulness, it presents a unique opportunity for a living memorial– one that can maintain vitality and relevance in daily life instead of sliding ever deeper into a mysterious past. This entry was posted in custom furniture, Uncategorized and tagged coffee table, console table, John Sarra, medullar rays, natural edge bowl, pin oak, portable mill, red oak on September 2, 2013 by johnsarra. Christine and I were invited to participate in an exhibition called A is for… which opens in June at COCA (Center of Creative Arts), and we turned in our art work this weekend. It is a group exhibition featuring 26 artists who have been influenced in one way or another by their children. Each artist chose or was assigned a letter of the alphabet–we chose F and S because they are our daughter’s initials. In this way the exhibition will end up presenting the entire alphabet. A catalog is being produced, and the work will be auctioned off as a fundraiser for COCA. After working my way through several designs, I settled on this low table. 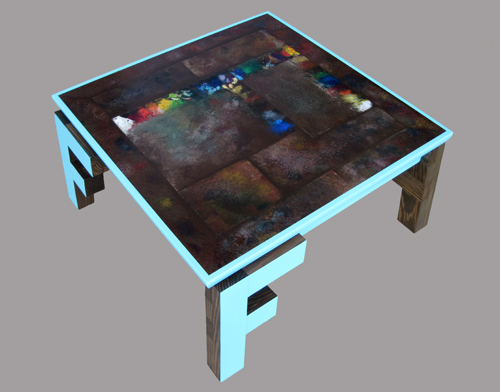 On the top, the F is created out of the mosaic of reclaimed painting palettes. Each leg is an F as well, made from yellow pine reclaimed from a shipping pallet. The pun is both convenient and meaningful. Palettes are a great symbol of ultimate potential, and function as a testing ground for the ideas of a painting. Pallets are facilitators, a means of transport and protection while moving from one point to another. In addition, Florence makes most of her own artwork at a low table like this one– a steady stream of drawings, collages, cut-outs, books, poems, and works which defy categorization. So I see these ideas at work in my relationship with my daughter as I try to help her discover her own potential and as I try to launch her gently into her own experience of the world. This entry was posted in custom furniture, events and tagged A is for..., Center of Creative Arts, COCA, coffee table, F, F table, palette, pallet, table on May 2, 2011 by johnsarra.